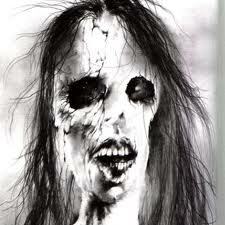 Example of Stephen Gammell’s horrific art for the Scary Story series. I think lots of us had the Scary Stories to Tell in the Dark experience. You read a story or two, innocently enough. You turn off the lights. Monsters and murderers come into your room and laugh at you until you either scream for help or wet the bed. We’ve all been there. Alvin Schwartz’s book shared horrifying folk tales and urban legends with young children, and Stephen Gammell’s artwork gave you something to imagine outside your window when the lights were out. I’m saddened to read the publisher has decided to wussify the Scary Stories artwork. As a survivor of trauma inflected by the original artwork, I’d like to say the suffering was worth it. Plus, Gammell is an Iowan boy currently living in the Twin Cities, just like me. Check out more of Gammell’s artwork here. My scariest Scary Story experience started on a bored afternoon at a friend’s house. We were in elementary school, and we somehow wound up sitting in his room reading stories together. We’d read the scariest bits out loud to each other, and we’d take turns pointing at the creepiest artwork. This friend loved to torment me when I was scared. He also spent many years pretending to die when we were play-fighting, and he would keep pretending he was dead just long enough to get me to walk toward a responsible adult in a near-panic. Then, he’d pop back up and laugh. This friend must’ve sensed I was scared, and he kept daring me to read more of the stories. It didn’t take too much prodding, because I loved the creepy tales. It’s just . . . we must’ve been alone in the house, because everything was too quiet. There were lots of places in this house where ghouls and ghosts could hide, and I was well aware of them as we turned page after page. I was scared, but I was pretty sure I had finally gotten grown up enough to handle scary stories with friends. I left his house and spent the night in my own bed. The next morning, my parents banned me from the Scary Stories books. They didn’t have to. I was too terrified to go through that terrifying ordeal again, and when I bought the books in college for research I was still a little scared of the red-nosed goblin guy on the cover. My friend is now a respectable husband, father, and adult. I still owe him one.